Three Bunnies Meatless Calzone Bento, a photo by sherimiya ♥ on Flickr. 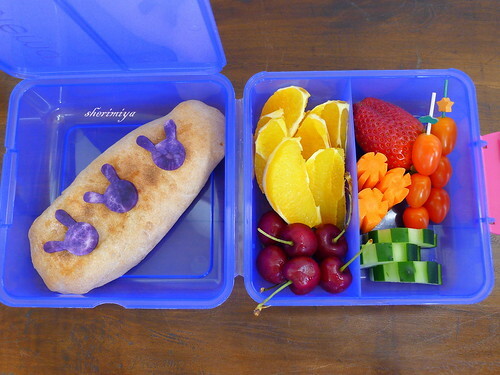 Using the Sistema box to house the ever-popular calzone bento today. I asked the kiddos whether they preferred pizza or calzones and they chose calzones. Go figure. While they aren't much to look at (at least mine aren't), they are pretty colorful and exciting inside. I used red pepper, eggplant, grated zucchini, grated kabocha, arugula and cheese. TinySprite watched me make them, and handled the dough a bit. Since they're kind of hard to close (what with all the fillings), I did most of the manipulation. She watched me adding the grated veggies and was fooled when I put in the grated kabocha, since it looks exactly like CHEDDAR. Hehehahaha! This is really the best box to hold a calzone, because it stays separate from the rest of the stuff and doesn't really need to be immobile. Well, except for the Okinawan sweet potato bunnies, which will likely fall off. The rest of the colorful sides include: orange wedges, cherries, strawberry, grape tomatoes, carrots and cucumbers. So fresh, it could almost be a spring bento! Is there a recipe for the calzone? Just curious whether you cook the filling first and how, etc. I've never made a calzone before, but these look amazing! I had this same box when I was in school. Way before I knew anything about bentos. The color is the same and everything. I wish I knew what happened to it. That calzone sounds amazing! I love tons of veggies added to my food, so that sounds like it would be right up my alley. Thanks Rini! It was accidental sneakiness. Really! MewlKitten, that's so cool that you remember the box! When I first saw this box I thought it was weird and would be hard to pack it. 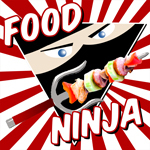 But it's the one I reach for with certain foods like calzone, char siu bao, even fat sandwiches like Vietnamese banh mi. Love it. I'm like you; I love max veggies. You can really pile them into a calzone; I hope you can try it! Calzone usually looks so boring but yours look so special! I don't need to mention about the colors. This bento has rainbow in it :) I'm curious what did TS say when she realized the cheddar is actually kabocha? She said: Oh, good thing it's very small! Oh. And LV´s eyes just popped out when spotting those cherries! Hahaha "look mom! They HAVE cherries there!!" Yummy! This lunch is so pretty and colorful! Big Momma, I have thought of colored dough and I think it would work great! I've also sculpted characters from the dough and that works too, but when you don't feel like taking the extra time, little add-ons will have to do :) thanks!